Yesterday we walked 11 miles-the Fitbit doesn’t lie! Really-that’s our idea of fun! 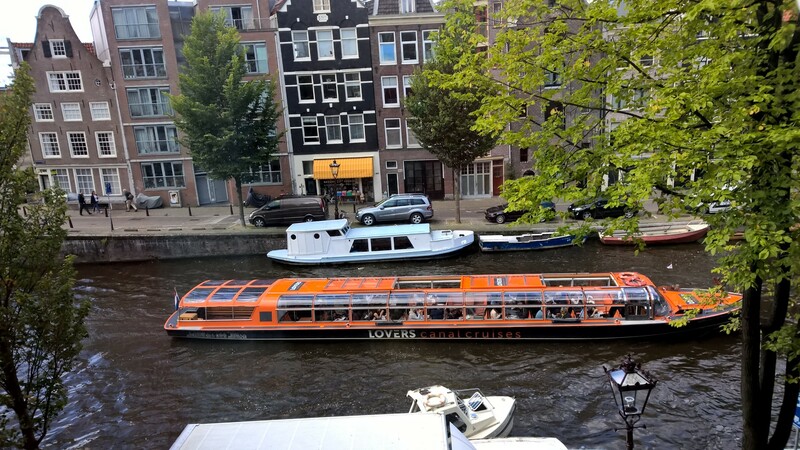 Now, if you aren’t walkers like us, you can get around Amsterdam in so many other ways-bike, scooter, car, boat, tram or train-and still have a great time seeing all the sights. 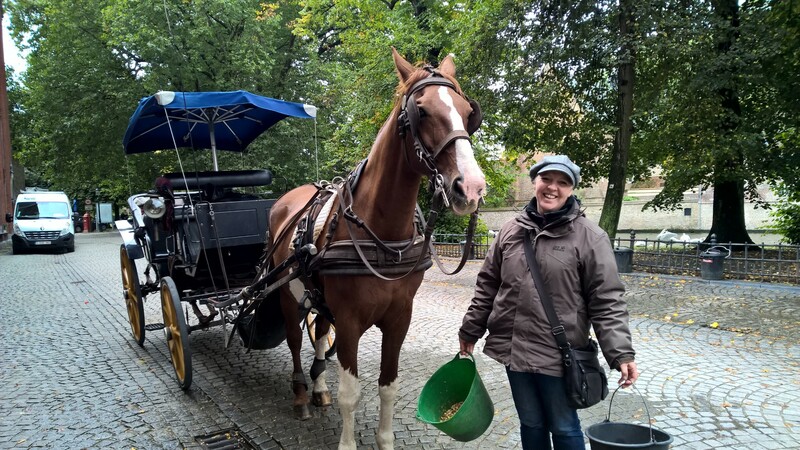 Of course, these other modes of transportation may set you back a few Euros but all are easy to find in town. Everyone rides bikes in Amsterdam-way more bikes here than in China even. Our lovely Hotel Andaz offered free bikes for use but my frozen shoulder would probably react poorly to bumping up and down on the quaint cobblestone streets so we chose not to try. 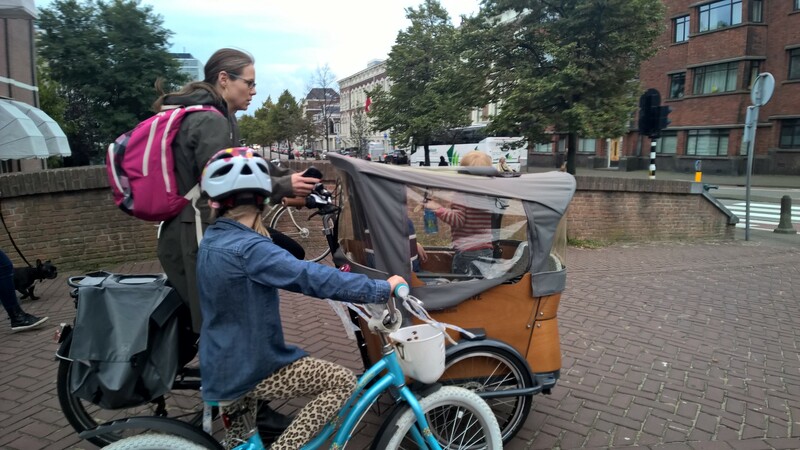 I love watching whole families commute to school/work on their bikes. Carts in front of the bikes allow for 2-3 kids to pop in while Mom or Dad peddles their hearts out. Our pollution and global warming (and health) issues would be greatly reduced if every county embraced biking like they do here. Next up the transportation chain is the scooter-very popular and driven fast so watch out when you’re walking. There aren’t really rules here other than walk fast and keep swiveling your head when trying to cross bike paths and roads so you don’t get hit by a biker, scooter or tram. They might try to stop for you but don’t chance it. The trams run on all major streets and cost $7 E for 24 hours or $1.6 E for one hour of riding. You buy tickets at machines but our credit cards didn’t work so we had to use cash to buy them. On the trams, you tap to get on and off but it’s the honor system and many didn’t even use cards. When you take a train, the conductor will come through and check your cards so no honor system there. 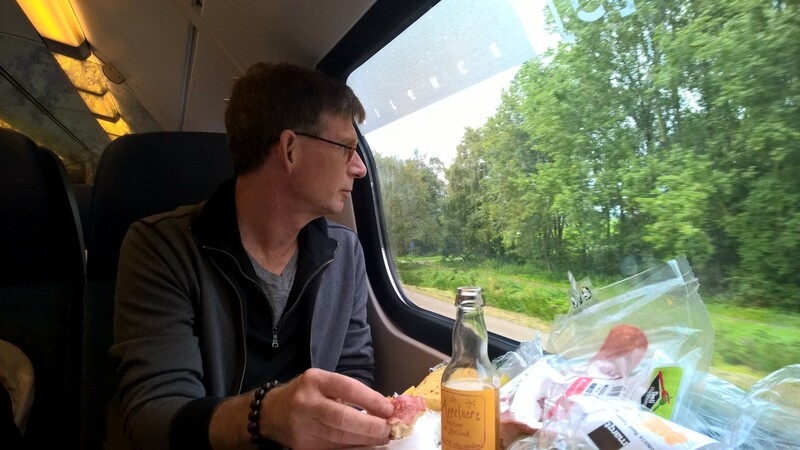 We travelled to The Hague and to Bruges by train-very easy and inexpensive way to travel and see Europe. Pack a picnic from simple fare like cheese/sausage/bread/fruit from the local grocery and enjoy the scenery as you speed through the countryside. If we hadn’t taken the train, we would have never seen a windmill or experienced another way of life other than the urban scene in Amsterdam. Boats are obviously popular here with canals in all the cities we were in. The average citizen may have just a motorboat to get around but there are lovely cruise ships for the tourists-about $15 E for a ride in the glass topped long and low boats. 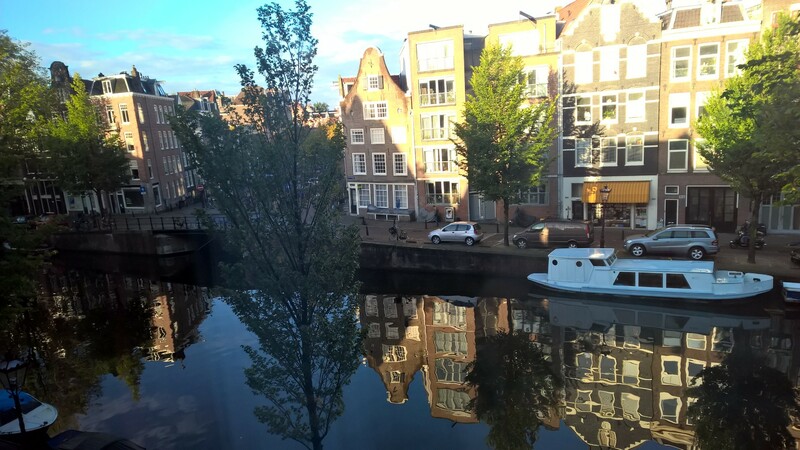 There are truly lovely houseboats where people live on many of the canals as well. Our new dream is to come over here for an extended stay in one of these houseboats. How fun would that be??? 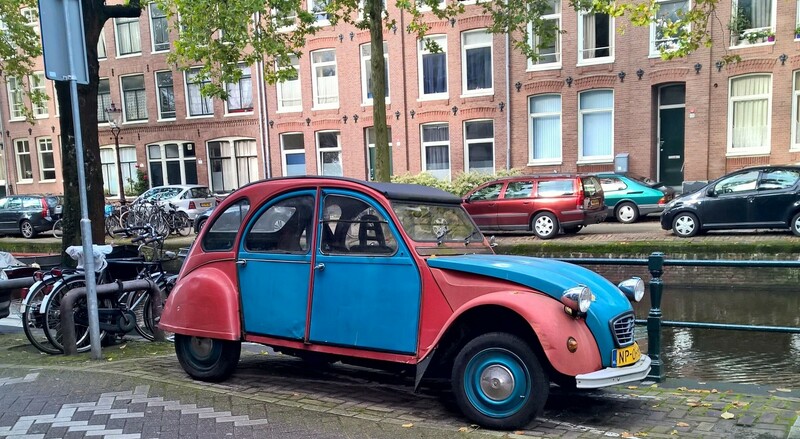 Do people have cars here? Yes, and are they ever teeny tiny! Parking is very limited along the canals and I’m sure many a car trying to parallel park beside one has missed and gone swimming. I’m terrible at parking so no way was I going to even try although they do have Car2Go here in abundance. No, I’ll keep on walking and enjoying the journey. 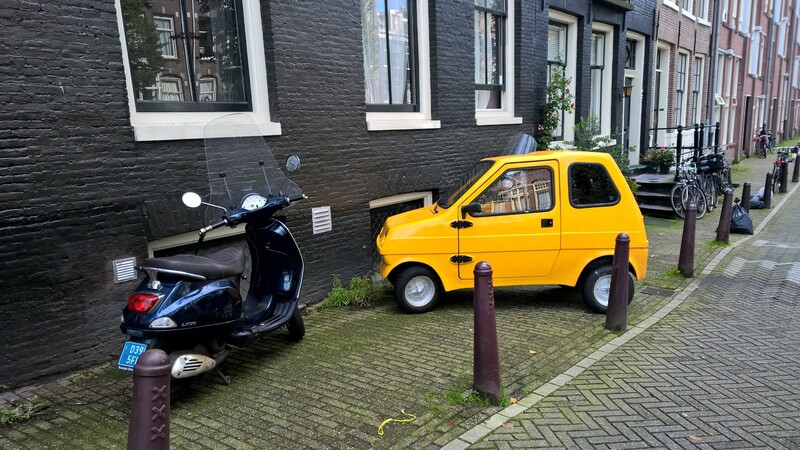 Scooter or mini car? Both have about the same room. These photos bring back memories. Loved biking through Amsterdam. 11 miles on the FitBit. WOW!